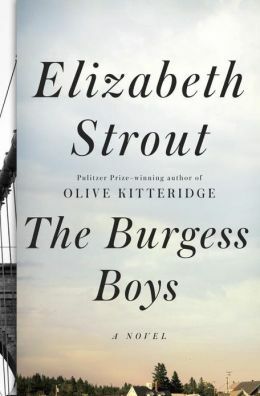 From a tragic childhood incident and a headline grabbing prank turned into a hate crime, Elizabeth Strout slowly explores the subtle interactions of siblings in The Burgess Boys. Bob, a legal-aid lawyer in New York, and Susie, a divorced optometrist who never left Maine, are twins, yet they have grown into strangers as adults who barely tolerate each other. Jim, the older brother and successful Manhattan lawyer, famous for helping to acquit an O. J. Simpson-like criminal, takes every opportunity to flaunt his success and belittle his brother and sister. Their small Maine hometown of Shirley Falls pulls them back together when Zach, Susie’s desolate teenager, is arrested for throwing a frozen pig’s head into the town’s Somali mosque during Ramadan. When Jim and Bob return to Shirley Falls to offer legal and moral support to their sister, Zach’s dilemma becomes secondary to the intolerance of the locals who feel invaded by a growing population of Somali, and the Somali Muslims who live in displaced fear of the terrorism they escaped in Africa. The dialogue hints at the seething prejudice in the town mixed with the forced charity, absent of real understanding. To be sure you understand, Strout has an omniscent narrator chiming in to explain. But the incident is only the catalyst to the issues facing the Burgess boys and their sister. The death of their father looms over the flawed personalities: four-year old Bob, left in the car with his brother and sister, accidentally released the car in the driveway to run over Dad, leaving them orphaned. Later in the book, the incident takes on new meaning, as the brothers verbally duel over Zach’s fate. The accident changed the family dynamics with their mother overcompensating for Bob’s guilt and Jim taking on new bravado, as the everlasting torturer of his brother. Susie is left out – disliked and ignored, to grow into a bitter divorced woman – with a strange son. The supporting cast of spouses and neighbors inject a mix of vitriol and sympathy; especially one character who provides a sudden jolt of karma to one brother when all seems to have been resolved with Zach. The setting goes back and forth from Manhattan and Brooklyn to Shirley Falls, Maine; but with differing perspectives of both areas. When small town Susie finally visits New York City, she is overwhelmed; Bob finds some comfort in his memories of small town living; Jim only wants to return to demonstrate his acquired big city prowess. The book sputters in starts and stops, with the constant bickering, anxieties, jealousies, and any other emotion possible with adult siblings. At times, you will want to send them all into the corner for a time out. Nevertheless, they are there for each other – as families usually are – and in the end, they all finally grow up and into adults with tolerance and more understanding of each other. Strout’s characters are not likeable, but they are unforgettable.